Great museums are exciting, stimulating, often overwhelming and quite possibly exhausting. The best way to enjoy a museum is not to rush from one room of exhibits to another. You need to slow down, linger – focus on spending time with a few works that particularly interest you. It’s impossible to take in everything the place has to offer in one visit, so don’t even try. In the following are a few of the world’s most compelling art museums. Happy lingering. 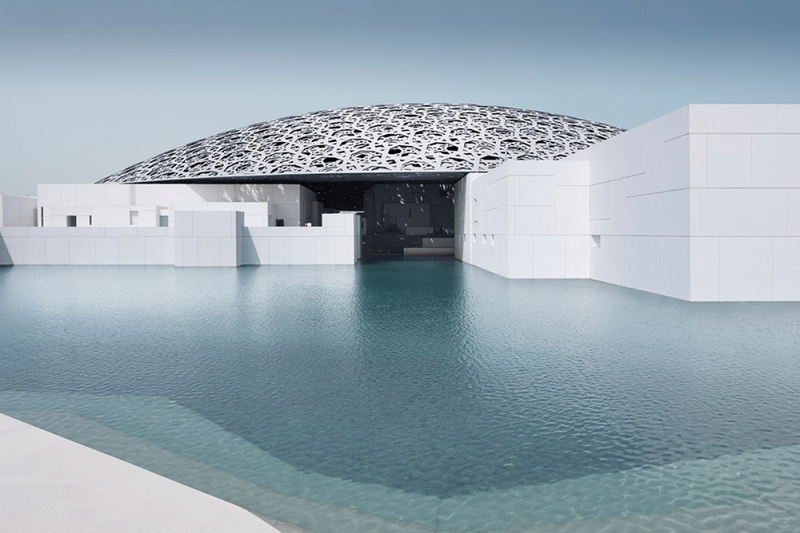 Louvre Abu Dhabi is a universal museum on Saadiyat Island that exhibits art and artefacts from ancient times to the present day. Its mission is to celebrate cultural exchange and diversity. Opened its doors to the public on November 11, 2017. Designed by French architect Jean Nouvel, the museum recalls an Arab Madina with its 23 permanent galleries, exhibition galleries, Children’s Museum, auditorium, restaurants, retail and a research centre. Surrounded by the sea, visitors can walk the promenades beneath the museum’s stunning dome. Artworks on display originate from civilisations all over the world. Louvre Abu Dhabi has acquired more than 600 artworks, including individual works, series and collections. These are exhibited alongside 300 works on loan from French institutions. Address: Saadiyat Cultural District, Abu Dhabi, United Arab Emirates +971 600 56 55 66 | louvreabudhabi.ae opening every day except Monday Saturday/Sunday/Tuesday/Wednesday from 10.00 a.m. – 8.00 p.m. Thursday and Friday from 10.00 a.m. – 10.00 p.m. The musée Yves Saint Laurent Marrakech, located on Rue Yves Saint Laurent, opened its doors on October 19, 2017. It conserves a part of the collection belonging to the Foundation Pierre Bergé-Yves Saint Laurent. More than just a museum, it includes a temporary exhibition space, a research library with over 6,000 volumes and a 150-seat auditorium. The museum was designed by Studio KO, an architectural firm established by Olivier Marty and Karl Fournier. On January 23, 2017, the Museum Barberini, Potsdam’s new art museum opened on Alte Markt in the historic city centre. Under the direction of Dr. Ortrud Westheider, the museum shows exhibitions with international partners. Dynamic, rotating presentations take place in 17 galleries. Exhibitions range from the Old Masters to contemporary art with a focus on impressionism. Based on works from the collection of Hasso Plattner, this museum presents three temporary exhibitions each year featuring loans from international private collections and museums. Monday and Wednesday–Sunday from 10.00 a.m.–7.00 p.m.
Every first Thursday of the month from 10.00 a.m.–9.00 p.m. The Zeitz Museum of Contemporary Art Africa opened to the public at Cape Town’s V&A Waterfront on September 22, 2017. It is a public not-for-pro t contemporary art museum that collects, preserves, researches and exhibits 21st-century art from Africa and its Diaspora. Designed by internationally acclaimed Heatherwick Studio of London, the museum was established through a partnership between the V&A Waterfront and collector Jochen Zeitz. Set on the edge of a natural-historic working harbour, with the iconic Table Mountain as its backdrop. The museum spreads over nine floors, carved out of the monumental structure of a former grain silo complex. Silo District, South Arm road, v&A Waterfront, Cape Town, South Africa +27 (0)87 350 4777 | zeitzmocaa.museum opening hours: Wednesday–Monday (including public holidays) from 10.00 a.m.–6.00 p.m. First Friday of the month from 10.00 a.m.–9.00 p.m. Closed Tuesday. The newly renovated Victoria and Albert (V&A) Museum boasts collections that are unrivalled in terms of their scope and diversity. The museum was established to inspire British designers and manufacturers. Its collections span over 5,000 years of human creativity, in virtually every medium and from many parts of the world. The V&A holds the UK’s national collection of the art of photography, international in scope and ranging from the year of photography’s announcement in 1839 to the present. The museum’s latest refurbishment project was designed by architectural firm Amanda Levete Architect. It includes a new entrance, a public courtyard and a large, pillarless exhibition space set 15 metres below ground level. Daily: 10.00 a.m. – 5.45 p.m. Friday: 10.00 a.m. – 10.00 p.m. The National Museum of Contemporary Art, Athens (EMST) began operations in 2000. The permanent home of the museum is the former Fix brewery on Syngrou Ave., the reconstruction of which was completed in 2014. The museum’s collection is formed around a very important nucleus of works by Greek and foreign artists. opening hours: every day except Mondays from 11.00 a.m. – 07.00 p.m.